In today’s day and age businesses are flocking to social media channels to get their name out there and their content exposed. They are creating content calendars, URL shortener’s videos and images to the 9th degree. All are important but it really isn’t everything. With social media, unlike traditional media, you have the ability to not just make things one sided (like with newsprint and radio). Instead, you have the opportunity to engage with content from other brands, even your competition. It is truly amazing that this simple tactic is mostly ignored by many businesses, small and large! By engaging with others content shows you care. People love to see that others care and if you engage with something they posted shows you care on what they have to say. There is for sure a psychology behind it. This caring will eventually become noticeable and there is a good possibility that this tactic can lead to new business, if not now, then down the road. It’s a way to show your expertise. If you simply like another’s post you are essentially telling them that you are endorsing that piece of content. If though you engage with the content by more then clicking the like button, whether in a statement or question form shows the originator of the post that you have expertise and authority in the subject and potentially can offer advice or solution. It can give you an opportunity to learn about your customer. You may be putting out content you think is what your customer wants to see and read. You may though be completely wrong. By engaging with others content can give you an idea of what they like and what they don’t like. Then you can adjust your strategy if needed. While content maybe king, without eyeballs reading, watching, listening and commenting on it, it’s all for nothing. 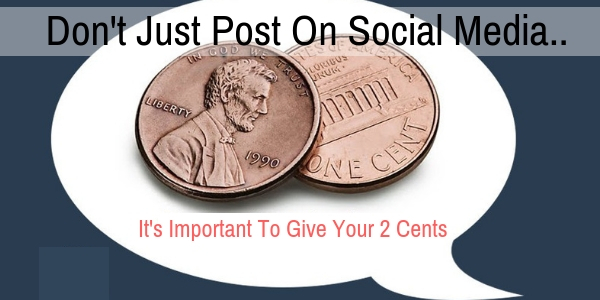 By you taking the time and making that extra effort to engage with what others are saying and posting can become a very valuable marketing tool in the long run. For a thorough strategy on how you and your brand should best engage with others on popular social networks including, Facebook, Instagram, Twitter and LinkedIn, contact The Interactive Imprint at 954-254-1650 or visit TheInteractiveImprint.com.